1 Word. Hook or buckle. Bitten apple. Drilling wood. Thanks for visiting us, here are the cheats for your favorite game. 1 Word. Find the answers you need and still have fun with the game that has hooked millions of people. 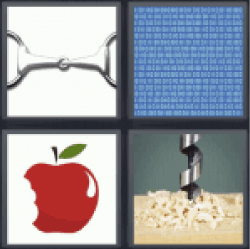 For easy and quick access to all answers of the game 4 pics 1 word add this page to your favorites list in your browser (4 Pics 1 W). Leave your comments at the bottom of the page, we will be happy to know your opinion and help you with all the answers you will ever need at all times. The puzzles are randomized, so the levels are different for each player. That means you can’t search by level number. You have to find your answers by word length. 4 P 1 W is a game for iPhone, iPad, iPod and Android developed by LOTUM GmbH.